It's handy to know the correct etiquette when you are aboard a cruise ship that's as close as possible to a Japanese bath-house, writes Katrina Lobley. With more than 3000 onsen - the word for both hot springs and bathhouses channelling geo-thermally warmed waters - Japan has elevated public bathing to high art. There's a whole set of rules, for instance, about the tiny towel that's carried around to enhance privacy. It's fine to take the towel to the water's edge and to even drape the towel on your head after clambering in - just don't dip the towel into the shared waters. 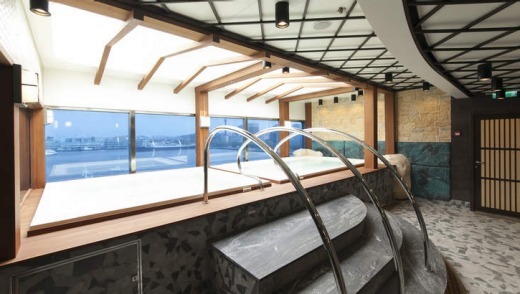 While no one claims Diamond Princess's new Izumi Japanese Bath is an onsen - instead it's an onsen-inspired facility - many of those age-old rules and rituals still apply. Like most onsen, Izumi isn't keen on bathers with tattoos, which in Japan are associated with the criminal yakuza. Izumi was installed during a $32 million refurbishment this year as a direct pitch to Japan's fledgling cruising market. Clocking in at 817 square metres, it is the largest facility of its kind at sea. Turning part of the ship's children's centre into a tranquil aquatic haven wasn't without difficulties - the extra pipes and drainage systems added weight to the ship's rear. The complex has separate sides for men and women. One side houses the rustic stone bath with an utaseyu (cascade of hot water); the other features the cypress bath with an aromatic steam room. Both contain multiple bathing areas and saunas with dramatic ocean views through floor-to-ceiling windows. These gender-specific areas alternate daily so everyone can enjoy the individual features. Outside, where swimsuits are compulsory, both sexes can flop into the open-air hydrotherapy pool with a view of the ship's wake. So comes the time to test out Izumi. Although the Japanese firmly believe in hadaka no tsukiai - or naked communion - with business colleagues, my industry companions and I elect to keep our swimsuits on. The first step before hopping into the warm pools is to shower. We park ourselves on tiny stools to soap up and rinse down before relaxing into the waters and sharing idle chit-chat. When we've had enough, we swaddle ourselves in robes (crossing left side over right) to pad outside for the final soaking. The series of immersions - all at different temperatures - is so relaxing it's worth contemplating the purchase of a multi-visit bathhouse pass. Izumi isn't Diamond Princess's only Japanese touch. The Singapore refurb added Kai Sushi, a restaurant with both table service and a sushi counter where diners can watch chefs slice, dice and artfully arrange sashimi and nigiri-zushi. I recognise every topping - scallop, salmon, squid, prawn and roe - bar one. Chef Dennis, from the Philippines, explains that my ship roll is piled high with sea urchin - a prized delicacy in Japan. "It makes you strong," he says. Its flavour is too strong for me. Meals can be accompanied by regional sakes, including the top-priced Kamoshibito Kuheiji ($US15 for 180 millilitres), the Nagoya sake that enjoys cult-like status among connoisseurs. Other cultural tweaks are more subtle. Green tea ice-cream is served at the ice-creamery near one of five swimming pools. Horizon, the all-day diner on Level 14, includes a ramen bar with customised toppings for the bowls of slippery noodles and scented broth. Early in the day, the buffet has crunchy vegetables, fish and rice that cater for the Japanese hankering for savoury breakfasts, as well as pots of creamy Meiji-brand yoghurt. While the buffet seamlessly blends east and west, some activities are language-specific: several movie screenings and shows are in Japanese only. The ship can also turn Australian, showing AFL games on the Lido Deck's outdoor movie screen. The traditional-style bath on Diamond Princess. As we circumnavigate Hokkaido with 672 Japanese, 388 Australians, 215 Americans and 31 other nationalities aboard, the Japanese passengers exert a sobering influence on shipboard behaviour. They rise early, dine early and retire early. We catch glimpses of delightful moments: a waltzing couple on the dance floor oblivious to all else; a flash of kimono disappearing around a corner on formal night. 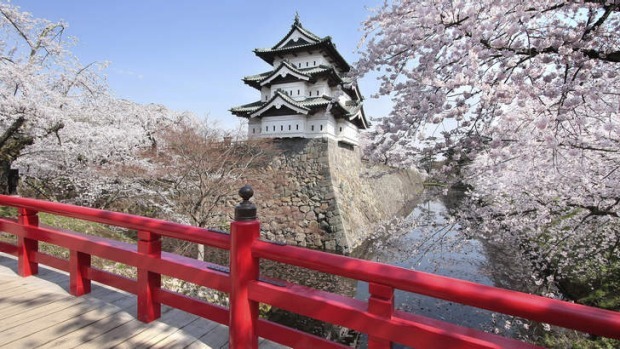 Our nine-night anti-clockwise cruise around lush Hokkaido - best known in Australia for the Niseko ski resort - includes two days at sea as we cruise to and from the port of Yokohama, near Tokyo. That time can be spent watching a selection of in-room movies or trying the activities: golf-putting into a pool, ukulele classes, core workouts, karaoke, ping-pong tournaments, multimedia trivia, gaming lessons, shows in the Princess Theatre and more. On-board life is a comforting cocoon but port days offer insight into the real Japan. The first stop is Kushiro, which is living up to its nickname as the "City of Mist". Our tour swings by the zoo where the red-crested cranes are at a distance. Red-crowned Crane Nature Park's marshlands offer a closer view of the graceful birds which are considered a national treasure and symbol of fidelity because of their lifelong choice of mate. Our guide, Akiba, says: "I'm Japanese but I'm so happy to come here because cranes are so beautiful." 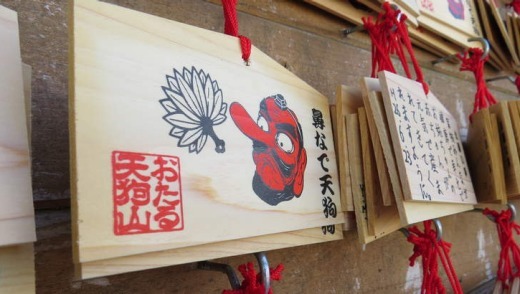 Otaru, on Hokkaido's western flank, is also home to a good luck charm. At a mountaintop lookout, next to the chipmunk park, is a red goblin with a long nose that people rub or pat in four ways, depending on their wish (a future spouse, a smooth birth, staying safe from traffic accidents or success at school). Vigorous wishing has rubbed the paint right off the goblin's nose. 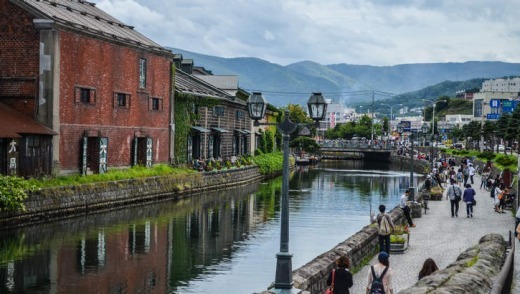 We stroll along Otaru's pretty restaurant-lined canal, lick towering ice-cream cones, shop for glassware and taste-test our way through Kitakaro. This "nouvelle patisserie Japonaise" sells green-tea chocolate wafers, Sapporo beer pies, mugwort-flavoured steam buns, black sesame-filled rice cakes and more. From here, it's possible to walk back to the ship - one of many reasons Otaru is my favourite port of call. In Hakodate, the waterfront red-brick warehouse district is illuminated with fairy lights at night. At Aomori on the Honshu "mainland", we snap Hirosaki Castle and its waterlily-filled moats from every conceivable angle. The stop that most piqued my interest pre-cruise is Russia's Sakhalin Island, off Hokkaido's northern tip. After buying roubles aboard the ship, we're bussed to Yuzhno-Sakhalinsk, where locals nervously flex their English to tell us what they can about their city, which is dominated by the pre-fabricated Khrushchev-era apartment blocks known as Khrushchyovka. The contrast with Japan couldn't be sharper. The 1932 Sakhalin Regional Museum, with its red-tiled roof sweeping gracefully into curved eaves, is rare testament to the Japanese occupation of southern Sakhalin before the Soviet Union claimed it in 1945. Between viewing a towering Lenin statue and arriving at a rented hall where mink-lined mittens, freshly baked pirozhky and painted babushka dolls are for sale, I catch the eye of a man sitting on a park bench holding a bunch of white chrysanthemums. He runs over and, with a twinkle in his eye, wordlessly thrusts the flowers into my hands. Catching up with fellow passengers, I wave my bouquet and joke that I just met my future Russian husband. Maybe I didn't need to rub the goblin's nose after all. The writer travelled as a guest of Princess Cruises. Diamond Princess's sister ship, Sapphire Princess, began home-porting in Shanghai during the northern summer. To cater for Chinese passengers, the ship increased its focus on shopping and food (there's a 24-hour buffet), and added more Chinese-speaking crew and activities such as tai chi at sea. See princess.com. Qantas flies daily from Sydney to Narita (Tokyo); Melbourne passengers fly Qantas to Sydney to connect. See qantas.com.au. Diamond Princess' Japan season ends in October and resumes in April. The nine-night Hokkaido cruise starts from $1869 a person twin-share. In November, the ship relocates to Sydney for cruises to Tasmania, New Zealand and around Australia. Fares start from $1515 a person twin-share for an eight-night Sydney-Tasmania round trip on January 2. The Japan cruise can be combined with a Japan land tour. Fares including the cruise start at $4889 a person twin-share. See princess.com; phone 132 488.